I've talked about Russian sage (Perovskia atriplicifolia) before (with propagating) but good things are always worth a second look! Our Russian sage is in full bloom in our front garden and should continue to burst forth with a bounty of purple blooms throughout the summer. 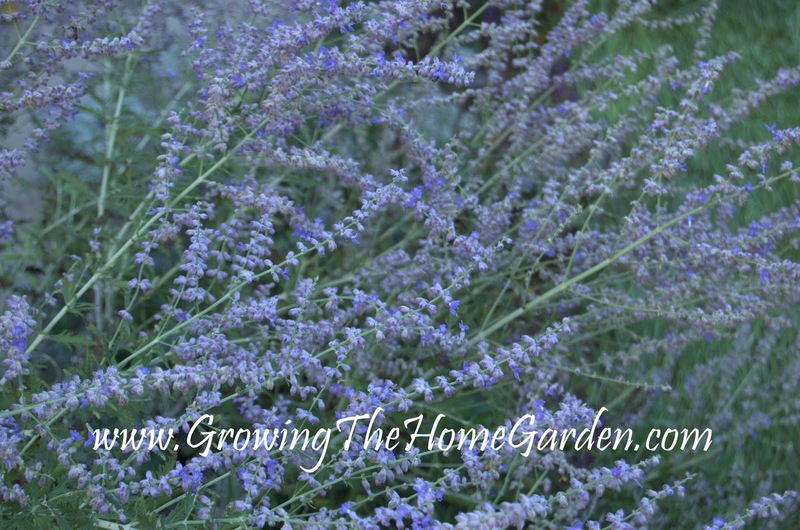 These powerful perennials are drought tolerant and have been extremely pest free. There are two varieties in our Middle Tennessee garden one called 'Longin' and another called 'Little Spire' . The 'Longin' Russian sage has performed better than the 'Little Spire' for in our garden. The 'Little Spire' seems to need more watering than the 'Longin' but despite the need for a little more water either variety performs great our Tennessee garden. 'Longin' Russian sage will reach up to 48 inches in height and needs some space to grow while 'Little Spire' is a bit more tame at a height of 36 inches. 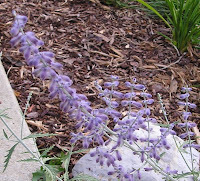 Here is what makes Russian Sage a great perennial in the garden. This perennial has silvery-green leaves with a gently serrated edge. The cool stuff doesn't end there! If you rub the leaves between your fingers they emanate a strong yet fantastic smell. That pungent sage-like smell makes them a good deer resistant perennial. I have deer issues in many areas of my garden but Russian sage has never been nibbled on by deer or rabbits. I would consider them to be one of the most deer resistant perennials available. 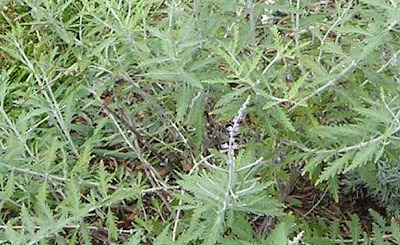 Russian sage isn't used for cooking but its smell might work in a dried floral arrangement or in a potpourri mixture. 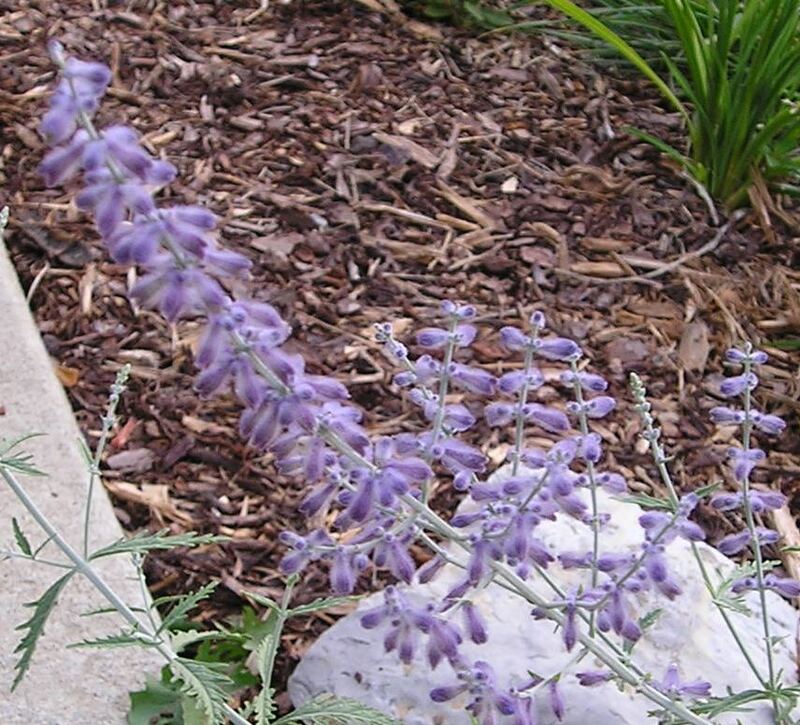 Russian sage reaches upward in an elegant and almost wispy form. Each branch stretches outward from the center of the plant and generally heads toward the sky. Our plants are somewhere around two and a half feet tall and haven't finished growing yet. Eventually I hope to have more Russian sage to put together in a mass planting with it as the center planting somewhere in our backyard. 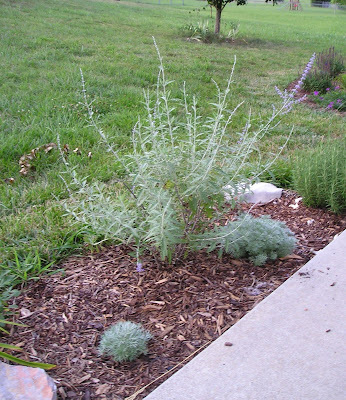 To keep it in good form prune Russian sage in the late winter or early spring back to 8-10 inches before new growth starts to grow. Each branch eventually ends in blooms. Not a bad way to end a branch when you consider how many branches it has and how many blooms you will get! The blooms of both varieties of Russian sage in my garden have the same color. Even though there may be subtle differences, all Russian sages have light, lavender colored blooms. The flowers also attract all kinds of pollinators, especially butterflies. Russian sage is Easy to Propagate from Cuttings! Surely you didn't think I'd forget to mention that! I wrote a post back in May about propagating Russian sage so I won't go over the process again here, but feel free to look back at that post. When you take cuttings in the spring, each cutting will cause the plant to sprout two new branches which will double the summer blooms. 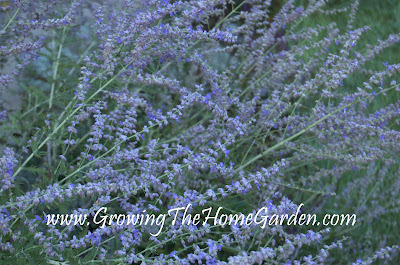 Edit: Russian sage can also be propagated through hardwood cuttings taken in fall or winter. 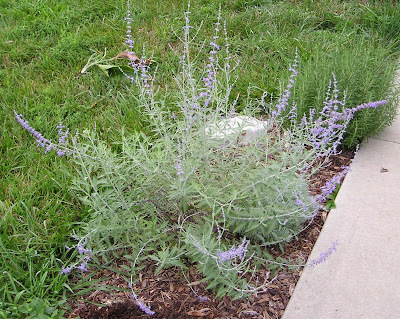 Russian sage hasn't become a staple perennial in everyone's gardens even though it is worthy enough to be. I like its uniqueness and that's important in my garden!